Common bird or rare bird? It all depends upon where, when, and how many you see! Photo by the author. Much of the fun of birding comes from the unexpected. You never know exactly what you will encounter in the field. Many birders put much effort into looking for rare birds--those that are not common for the area. Most birders seldom discover a bird that is a state rarity--a bird so rare that the state rare bird records committee asks for details. Many birders dread submitting a report to the state committee. To have your exciting bird report vetted by strangers may take the joy out of that sighting, especially when a letter comes back that starts, "We're sorry, but your report of...."
You don't have to report a rare bird. But if you keep your noteworthy sighting to yourself, well, that doesn't seem quite right either. Birders love to share. And we can make a contribution to science if we document our birding. Thus many today are using eBird as a way to document and share sightings. Now, however, eBird automatically filters for rare birds at the county level. Thus, you may be asked for details by your local county Reviewer for early or late reports, high numbers, or locally rare birds, in addition to state rarities. What do you do? Get mad? Refuse to answer the email request for more data? If you do answer, what do the reviewers and bird records committee members want to see? Perhaps I can help you to understand by giving two real examples that came to me recently. The first was by a presumably good birder, the second by a self-declared non-birder. Take a look at the difference and see how these examples can help you write your own rare bird reports. The first example comes from an eBird request for details on a very rare bird. This birder replied that he was very familiar with this bird from the time he spent living in a location where this species was regular. He announced that he knew what he saw. He had taken photos of this species before and I could look at his bird photo album if I wanted to verify that he had identified the bird correctly in the past. He supplied a long list of credentials of his education and background. The second example was a recent unsolicited email I received. It started, "I'm not really a bird watcher, but I saw this bird and I don't know what it was." Perhaps many of your conversations with non-birding friends, family and acquaintances also start with the words, "I saw this bird..." This person then went on to describe the bird, saying it was brownish overall, a bit bigger than a robin, had a bill slightly longer than the head, it had red in the wings when if flew, had white on the back, and was covered with spots. It spent time poking on the ground and flew up onto a fence. Do you see the difference? I know what the second person, the supposed "non-birder," saw. He told me exactly what he saw. The first person, the one with the credentials? I have no idea what he saw. I have only the name of the species he concluded he saw. There's a big difference. The "report" of the first person is not acceptable as evidence, even if he did see what he says he saw. The list of field marks from the non-birder is acceptable as evidence, even if the observer didn't know the name of the bird he saw. Field marks, comparative size, sounds, behaviors, habitat. The "birder's" report lacked any description whatsoever. The "non-birder's" report described exactly what he saw. 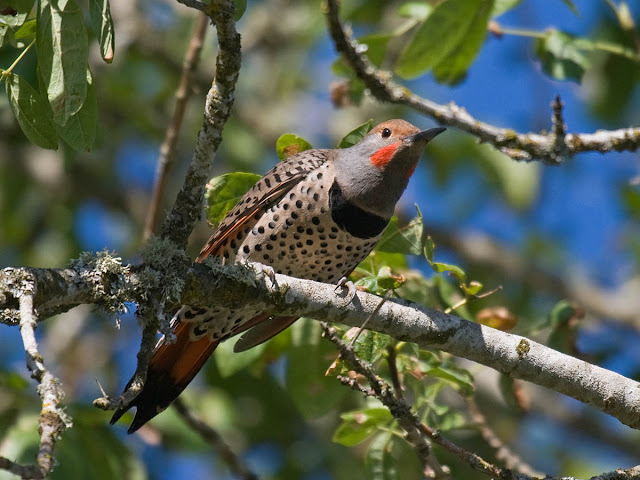 A good rare bird report describes the bird so that if you left off the name of the bird, another birder would know exactly what bird you saw from your description. So, please, the next time you get a request for more details on an unusual species, don't get upset, fearful, angry, or defensive. Just describe the bird, not yourself. Words of wisdom there Greg. I am so guilt of reporting my past experience with birds. I suppose we feel we have to somehow establish our credibility first (our ethos of you will). But what better way to establish credibility with a reviewer than presenting an excellent description of the bird! My eBird method is to wait for a birder with a locally established (good) reputation to report the same bird. It's amazing how your reports sail right through when you say, "continuing bird; reported by Pete Dunne yesterday." well...that works too. Good one Kirby! I try always to go through the many, many websites [online] that I possibly can and usually find what I'm looking for to ID a bird I've not seen before. It's a good challenge, and a learning process. But I can certainly understand what you posted. A few times, I've seen a species that supposedly doesn't 'belong' in this area by any means, yet when I go online, I find that I'm not the only one that has spotted/photographed a certain species. Great thoughts! I actually enjoy getting those emails from eBird. If I'm certain of my ID when I post it on eBird, it's kind of nice to think it was worth being noticed. And the eBird reviewers have always been kind in their emails and responses, so there's no reason to fear. That said, when posting a rare bird, I think it's good to provide any details you can, since that can help others that may be using your checklist to find the bird for themselves. And if I have photo of it, I upload the photo and link to it in my eBird checklist so interested people can see the bird for themselves. Thanks to a wonderful blog. Japan is autumn. I am also a painful season. I love the Japanese, but this autumn. Please search the Kyoto, Japan on a PC. Autumn is a very bright red leaves in Kyoto. Friend of Japan, Ryoma Sakamoto. I'm sorry I was wrong spell. Fantastic photograph and post! Terrific suggestions on how to place a descriptive rare bird report!